As the spring snow falls in Colorado and I shiver with a hot cup of tea trying to stay warm I think to myself, ‘well, at least it’s not as cold as Latvia!’ Riga, the capital city of Latvia, is officially the coldest place I have ever been. I make the trip to the former communist republic with my good friend Jean. We are studying at the University of Edinburgh when we decide we need a girl’s weekend getaway. We look on the Ryan Air website and pick the cheapest, most desirable destination. We book our tickets to Riga for a mere £30 each (approximately $60 at the time). Neither of us know much about Latvia but are excited for our Baltic adventure. We arrive at Prestwick Airport in Glasgow, check in and celebrate the beginning of our trip with a glass of wine at a little café near our departure gate. It is an evening departure and the velvety red wine is soothing after the day full of preparation and travel. After our cocktail we proceed toward our gate and board the Boeing 737 aircraft. As we take off, Jean begins work, studying for our courses at the University of Edinburgh, and feel like a slacker as I doze off to the roaring sound of the airplane engine. I awake to the passengers clapping, in appreciation and admiration of the pilot, which seems customary on domestic European flights. We collect our belongings and make our way out the plane, through the airport; to an old, shabby looking taxi that takes us to city centre where we will be staying. We arrive at our hotel and check out our en-suite room. It is comfortable, a bit drab and small but perfect for us budget travellers. We leave our luggage in the room and decide to check out the city a bit before bed. We wander despite frigid temperatures and attempt to get our bearings in this Eastern European city of two million people. Riga sits on the slow moving and wide Daugava River in the heart of the Baltics. Not only literally cold, the city feels like it is just coming from the ‘cold’ of communism. A picturesque and historic city centre mixes awkwardly with the concrete municipal buildings and soviet era transport. The next morning, after a restful night’s sleep, we continue our survey of this fascinatingly different city. We take a bus tour and see the city from a cosy, warm double-decker bus. The bus passes the Daugava River and I see people forgoing use of the bridge over the river and simply walk across the frozen solid water. 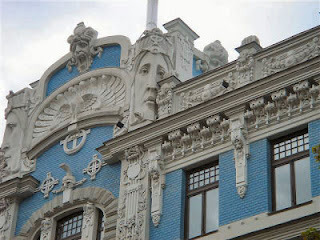 Riga is the capital of Latvia but also of the Art Nouveau movement that was popularized from 1890 to 1905. Riga is a UNESCO World Heritage site because of its historic centre that is location to the finest collection of Art Nouveau buildings and is unparalleled anywhere in the world. Over 800 buildings, many of which were built by the Latvian-Russian architect Mikhail Eisenstein, showcase facades brimming with decorative detail, obelisks placed atop cornices, sculpted vases, lions, sphinxes, flowers and more. Architecture aficionados flock to Riga as if on a pilgrimage. Art Nouveau is the most Manneristic of styles in architectural history- characterized by distorted elements of scale and perspective. Our day of sight seeing is enjoyable and interesting albeit freezing. The evening approaches and we meet up with one of Jean’s family friends. Father Kristaps is a Latvian catholic priest who spent a good deal of time in America. He speaks perfect English and is one of the most hospitable people I have ever met. He is very proud of his country and gives us an in depth city tour…by car because it is way too cold to stroll around by foot. We learn interesting information about Latvia such as the country's important contribution to worldwide Christmas tradition, the Christmas tree. Also, did you know when giving flowers in Latvia (and often in Eastern Europe) one must always give an odd number of flowers unless at a funeral when giving an even number of flowers is appropriate? After our tour he takes us to a traditional Latvian restaurant, Lido, which is a chain in Riga. Traditional food is served here cafeteria-style; you take a tray and wander around wanting to grab almost everything. The food is by no means gourmet but hearty, heavy, and relatively inexpensive. There’s a wide variety of pork, chicken, soups, vegetables in varied sauces, pancake dishes and desserts. We share in conversation over a fortifying meal and local Latvian beer. After dinner, Father Kristaps drops Jean and me off in the city centre where we peruse the area for a happening place to have a drink. 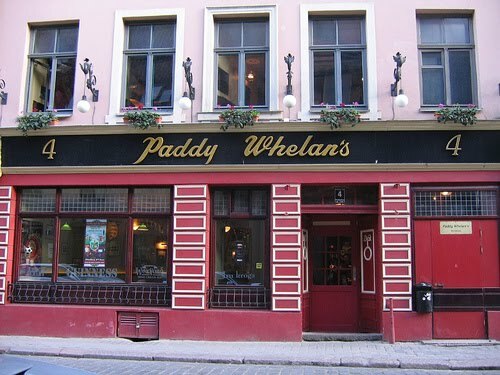 We have a drink at a few establishments in Old Town Riga before settling on Paddy Whelan’s, an Irish pub, for our final destination. 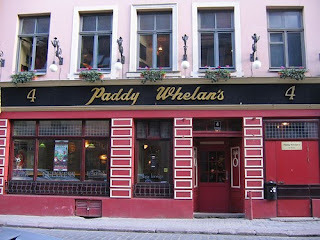 Whether you’re in Dublin, Bangkok, or Riga, an Irish Pub is always the liveliest place to have a beer! We meet a crowd of drunken Englishmen who are in Riga celebrating a stag party (bachelor party for all you Americans.) They are very friendly and offer up a few laughs as well as some heated discussion on Scottish independence. One of the Englishmen says, 'Scotland isn't a country, we call it Scotlandshire (a shire is a rough equivalent to a county in America) because it's really just another division of English land.' Being fiercely proud of my Scottish heritage and thoroughly in love with Edinburgh and all things Scottish, I beg to differ. It was quite Ironic- two Americans in an Irish pub arguing Scottish independence with Englishmen. We part ways with the Brits and wander back through Old Town to our hotel as it begins to snow. We reach our hotel room and fall immediately into what seems like a beer induced comatose sleep. Jean and I awaken the next morning with dry mouths, headaches and a nauseous feeling I hope never to repeat. I sit up in bed and imagine stars around my head as if knocked out in a cartoon fight. We get dressed and go out in search of a fizzy Coca Cola and a greasy diner-type brunch to aid in our cure. We end up at a popular American chain, specializing in ‘flare’ and celebration of the beginning of the weekend, which shall remain nameless due to my sheer embarrassment (I’m not really an American chain restaurant kind of girl). It is comforting, greasy, spicy and a very guilty pleasure. Our second day in Riga is even colder than the first. We struggle being outside due to the frigid cold and humidity that intensifies the extreme wintry weather. There is a popular British expression, ‘it’s Baltic!’ which means it’s freezing and the origins of the phrase become very clear. We walk from the restaurant to a nearby coffee shop with haste. We down a warming coffee and then another. We speedily move from the coffee shop to the Museum of the Occupation of Latvia (from 1940-1991), trying not to be outside for too long. We ponder the haunting exhibits while wondering what the next heated, indoor space we can visit will be. We decide to visit a café and enjoy a little 'hair of the dog', some mulled wine to warm ourselves. We make our way back to the airport and board our Ryan Air flight bound for Glasgow Prestwick, which compared to Latvia seems like a tropical vacation destination. We arrive back in Glasgow where my darling husband is waiting with a car to drive us home to Edinburgh. To try to describe the cold of Riga in my warm house next to a hot cup of tea doesn’t quite do it justice. It was absolutely freezing! My visible breath, a frozen haze, was a permanent fixture in the air in front of my face. The cold would cause my nose to drip and eyes to tear, seeming to freeze on the spot. Parents bundle their children in down-filled pillow suits that remind me of the movie A Christmas Story when little Randy Parker in his snowsuit says, ‘I can’t put my arms down.’ People don their fur hats, coats, gloves, lined boots, scarves, mufflers, ear muffs, etc. PETA doesn’t have a chance here! Although literally freezing, and the coldest place I have ever visited, the hospitality of the Latvian people, especially Father Kristaps, and the time shared with a good friend leave me with the warmest memories. I thoroughly enjoyed my time in Riga, a Baltic winter wonderland, and think back tenderly on all those shivers.